The community of Whitefish, Montana, which sits in the shadow of Glacier National Park, is situated in one of the largest wilderness areas in the continental United States. Mountain ranges surround the Flathead Valley and numerous rivers flow through it. The ecosystem’s health is evident in the area’s abundant wildlife including grizzly bears, elk, moose, wolves, mountain lions, and many other critical species. The community of Whitefish is reminded everyday why sustaining a pristine natural environment is essential. Experiences in nature foster a strong appreciation for the natural world and a value set that is oriented to ecological preservation and environmental stewardship. These values played an important role in establishing Whitefish School District’s Center for Sustainability and Entrepreneurship. 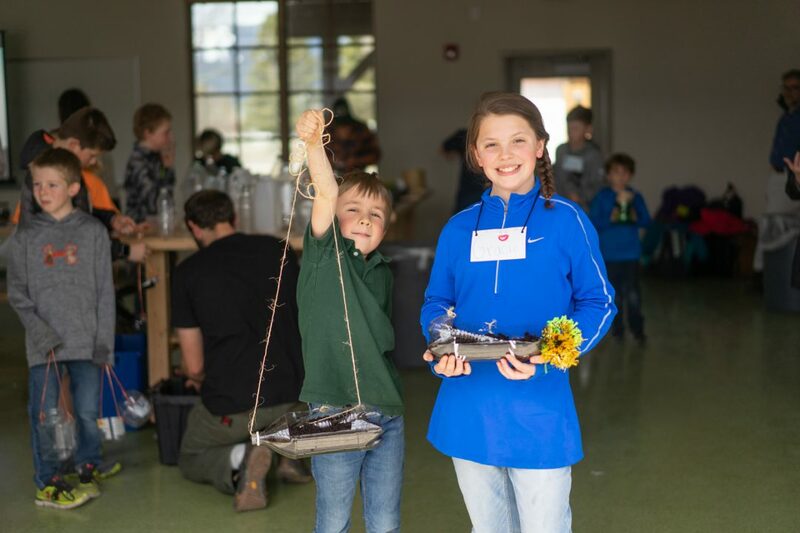 Whitefish School District (WSD) has been implementing sustainability-related programming for decades. Passionate teachers, students, and administrators have fostered initiatives such as recycling, school gardens, energy conservation programs, and environmental education, to name a few. In 2016, WSD began to document and coordinate the various sustainability initiatives that were occurring in the district. This process revealed the depth of sustainability-related learning and action that was occurring. WSD’s efforts were recognized when the district was named a U.S. Department of Education Green Ribbon School District in 2017, the first school district in Montana to be awarded this honor. While WSD was gaining a better understanding of the growth and reach of their sustainability programming, the district was engaged in designing and planning for an innovative facility that would complement its current work. This facility, the Center for Sustainability and Entrepreneurship, officially opened in April 2018 and is a natural extension of the values and sustainability programming that is occurring in WSD. The $2.65 million Center, funded primarily through community philanthropy along with some local, regional, and national grants, is a living laboratory that is intended to serve as a centrifugal point in which K-12 students and community members can experience sustainable agriculture, sustainable forestry, sustainable energy systems, sustainable building practices, and green career pathways. 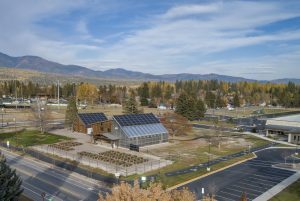 It also happens to be the first net-zero facility in Montana. The initial vision for the Center was driven by students and teachers who wanted to create a four season greenhouse that could serve as the basis for learning and experiencing. This vision evolved beyond the greenhouse concept to include classroom learning spaces as well. During the initial design phase, it became clear that the facility would rely on energy for lighting and heating. To align with the district’s ethos of sustainability, it was decided that the Center would be a net-zero energy facility, relying on energy derived from the sun through a photovoltaic (PV) solar array and greenhouse climate battery system, and from the earth through a closed loop geothermal system. The building is comprised of a 1,200 square foot greenhouse and a two-story classroom building that contains two learning spaces. The three-acre outside space, which is still being developed, will eventually consist of a production garden, food forest, experimental forest, wetland, and outdoor classroom. Beyond having a positive impact on the district’s energy footprint, the Center will enable students and the community to experience and learn about renewable energy systems, integrated design principles, and energy conservation strategies, in addition to agricultural programming. Fifth-graders and first-graders worked together on a design challenge to create hanging planters from plastic bottles. Students in Advanced Chemistry experimented with permaculture strategies to develop and strengthen the soil. 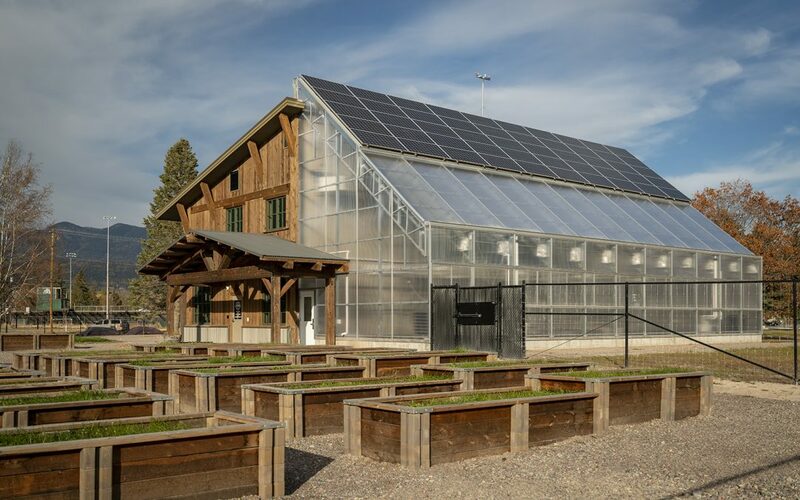 Students learned how the greenhouse’s rain water catchment systems are used to grow food as opposed to pulling water from groundwater reserves. The skills, knowledge, and experiences that students acquire through ongoing experiences at the Center will help them develop a sustainability mindset that will give them the confidence needed to take action in their community and environment. It’s hoped that building a generation of sustainability-minded citizens will help the community of Whitefish be better prepared to deal with the implications of resource scarcity. By learning within and about a net-zero energy facility students will have the resources they need to plan for resilience and adaptation. In addition to creating the next generation of sustainability-minded citizens, the Center also brings community stakeholders together to form an ethos of sustainability. Through adult education and WSD’s partnership with the City of Whitefish, the Center looks to offer programming that encourages community members to learn about a variety of sustainability-related topics, such as installing a PV solar array on a home, harvesting elderberries and making syrup, and creating a backyard food forest. The Center also serves as a catalyst for community-based action, enabling WSD to form myriad partnerships with everyone from local farmers to Glacier National Park. One partnership that has furthered the region’s capacity for renewable energy is with Flathead Electric Cooperative (FEC). The Center’s solar PV system was so large that new structures and policy had to be created to link the Center into the power grid. As a result, FEC expanded their designated threshold of kilowatt hours generated from solar systems. This partnership also made it possible for WSD to conduct energy audits at each school to improve energy efficiency and conserve resources. The community of Whitefish and WSD exist in the shadow of one of the best examples of climate change. The diminishing glaciers in Glacier National Park are a constant reminder of the work that needs to be done to educate students, community members, and local government about the challenges we face and the energy efficiency strategies that need to be put in place. The Center is a catalyst for changing behaviors, building knowledge, and fostering a shared vision for a sustainable future. WSD hopes to build on the momentum created by the Center to develop a holistic model of sustainability integration for other school districts and communities to follow. Ryder Delaloye is Curriculum Director for Whitefish School District. His teaching experience ranges from second-grade to graduate level and he has taught domestically and internationally, in public and private schools. Ryder’s passion is in Sustainability Education and he has worked in numerous schools to foster and support whole school sustainability programming.